Ahh, a zero in the comfort of a home! It’s really relaxing at E’s place, and it’s nice to have such a chill place to get things organized in many ways. The day started off sleeping in (6:30am!) and laying in bed till after 8am when I finally got up and we made a great breakfast. We all were happy to have slept in and it was a nice relaxed morning. Can I say relax enough times!? I’m definitely thankful to get this break from the trail to tend to things I’ve purposely pushed to the side for this day. I sent my laptop here, but internet in Fairlie can be slow and cut in and out. I was able to do many of the things on my list. I prioritized the most important stuff, and we went into town to the library (attached to the high school) where I did get online for a few hours. Still, I have many personal things that didn’t get done swimming in my head that seem never ending. I’m in a mood to hermit for like a week and just lay down and watch tv. It’s so tempting to do! I get like that when there is a long list of stuff to do that I’m procrastinating (like researching Tasmania and filling out the extension form for taxes). Maybe I’ll do it in a couple weeks, but I did enough for today. A swing in honor of Becky. You are missed!!! I have to tell myself that the important things are done, and I have plenty of time to take off if need be to do more in a couple weeks. I should book a flight out, and I want to go to Tasmania after the trail for about a month if I can. I just pushed off looking at that for another couple weeks, but I did book the very popular Overland Track there for early April since it was filling up. I figure I’ll work around that date and am relieved to have that booked at least. The date can be shifted if it’s available, but I wanted to get one before they are all gone. I can’t believe Tasmania is happening! I just don’t want to be locked into anything just yet with a flight out, and felt like I needed to first focus in more detail on NZ side trips to ease my mind of that. I did look at options for upcoming side trips, and though it does wear me out to read and research it all, I’m excited about all the options that include probably the Mt Aspiring area and the Kepler, Routeburn, and Milford Tracks. There are endless little things to fill months of hiking as I head further south, so I’m trying to do the ones that really appeal most to me first. By the time I did all that, booked a flight for a family gathering in May, and cleared my email inbox, I was done for the day. I just have to tell myself it was enough for one day. Whew, this vacation thing is tiring, ha! As a side note, I did manage to leave my long sleeve town clothes shirt at the library…on a three day weekend…ugh! Good thing I can leave my bounce box here with E and she will be able to go back and get that for me. I still don’t have a replacement for my back pad to my pack I left in the hitch the other day, and fortunately haven’t noticed it at all…except when I want a sit pad. I may just live without it the rest of the trip since I have many back home to replace it. 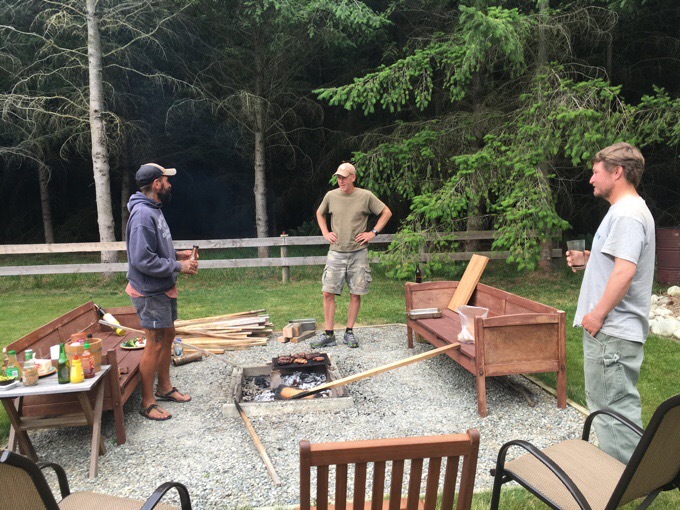 We went back to E and Andy’s house, and Andy grilled up some meat over their fire pit. He even had some venison (deer meat) that he recently hunted. He cooked it to perfection and it was like a mix of steak and brisket if you ask me. 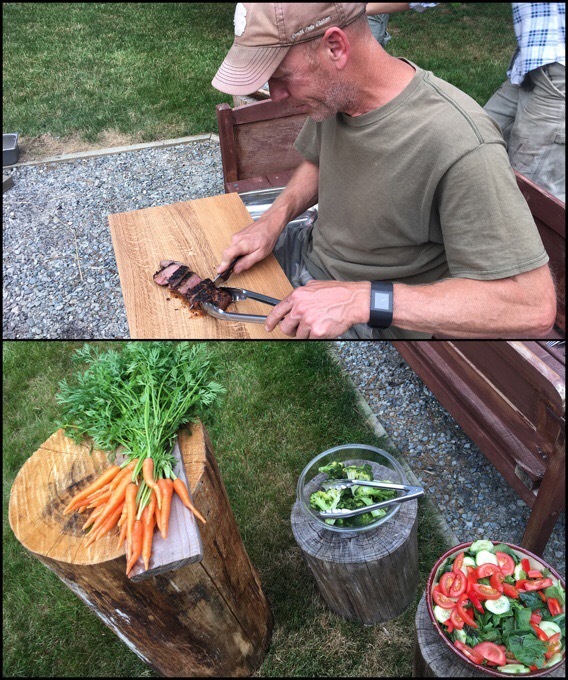 Cutting the venison and fresh food. Carrots are right from the garden! I was surprised that I liked it quite a bit. 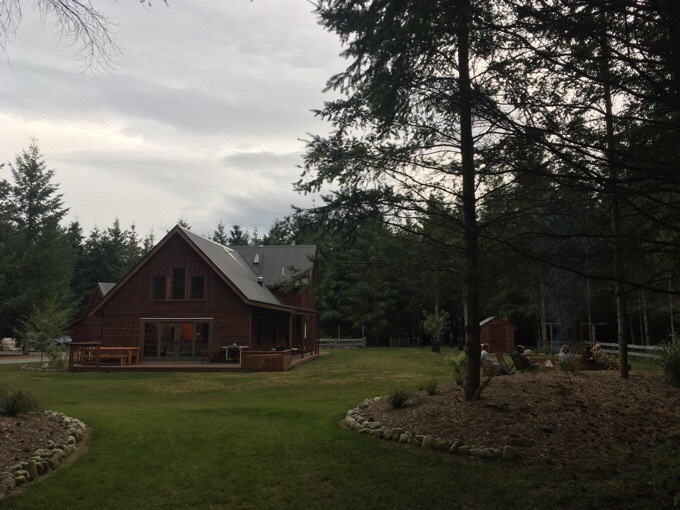 Can’t believe I ate deer and liked it…It was really a perfect summer night with a slight breeze and perfect temperatures. Andy and E got an offer on the house they accepted today, so there was a big sigh of relief there for them! I’m so glad to have been able to spend time here before they moved. 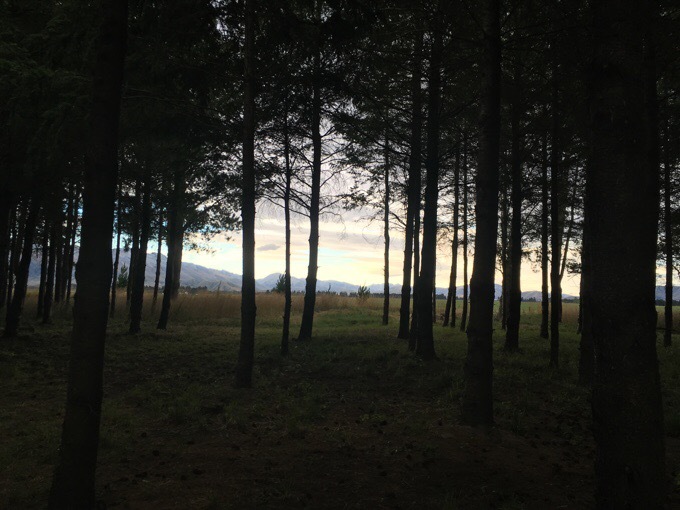 I love this view from the house of the mountains through the trees. We all were pretty tired early on in the evening. It’s just so relaxing here, and we’ve been going pretty steadily for awhile. It’s like that delayed reaction where you rest and then your body realizes it should be tired. We are going to sleep in a bit tomorrow and head to Mt Cook to play tourist and spend the night at the Mueller Hut tomorrow night hoping for a great sunset and sunrise. Then we will head back to the TA the following day. Felix has decided not to do the Mt Cook side trip, and we will drop him back off to the TA in the morning on our way out. Felix has always had a strong pull to be back in Germany, and misses his life there. He’s a jointer/cabinet maker in Germany and has his own business. 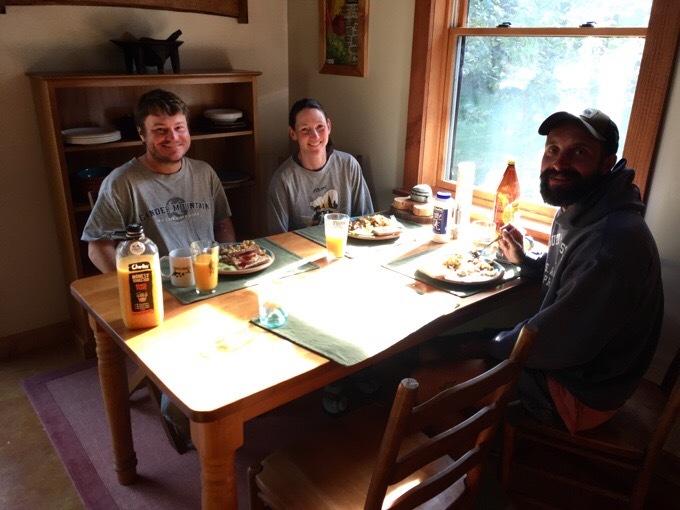 Being here at E and Andy’s was a fateful kind of thing for Felix, and it only strengthened his love for being home and creating things after seeing what Andy and E have built out here. He’s now more focused to move on and get home to the things and people he misses and loves so much. We will miss him, but it was fun catching that bearded rabbit for a few days. 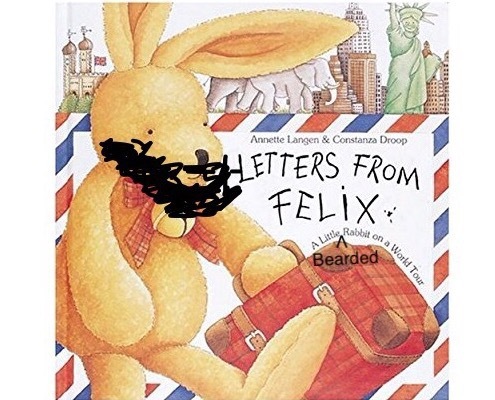 I joked that it would make for a great book series to have “Felix the Bearded Rabbit,” and he said there was a book like that! Check it out, ha! Ok, I promised myself I’d get to bed before midnight tonight…It’s 5 minutes till! Goodnight! THANK YOU to E and Andy!!! So glad that you are still coming to Tassie. I hope the overland is not too restricting for you as you can only go to the next hut each day during the regulated season although there are side trips. I go up there in winter these days and walk wherever I like. I once walked for two days without seeing another soul. Enjoy. I was wondering about that, but it may be the very last thing I do before leaving back to the US, so I think I’ll like relaxing! If you are flying into Hobart and need transport or accommodation, my wife and I would love to help out. We live on the Tasman Peninsula about an hour from the airport. A lot of hikers fly into Launceston or Devonport though as it puts them closer to Cradle Mountain at the start of the overland. We might be able to pick you up from Lake St Clair at the southern end as another option. I just emailed you Grant! What a “perfect” day off! You can walk the PCT (Penguin Craddle Trail) from the north shore of Tassie to craddle mountain…great bush walking and diversity.. Your timing couldn’t have been better for this visit. Someone will be getting a wonderful home and I like to think many happy times will be had. Meanwhile E and Andy move on to the next chapter for them.. as you hike on. Excited to experience Tasmania through you.. but first, more New Zealand. Things are unsettled here, for sure, and will likely be that was far past your return. Yeah, E and Andy are not looking forward to that aspect of returning to the US. I like the photo of you on the swing and the caption too; you look happy! Hey Wired! We just did the Kepler and the Routeburn Tracks in late December and loved them. They are not up on our blog yet, but, if you have any questions, let us know. We also did the Rakiura Track on Stewart Island if you want to keep going. Ha! So jealous that you are heading to Tasmania! The Overland Track is on our list. We’ll look forward to reading about your experience! Oh great! I may email you, but I think I’ve got good info on doing those without the need of permits if I don’t get one. I will do them as I get down there and see when a good opportunity comes with my timing and weather. the next blog will be a goodie,,, Erin had a good day today…. 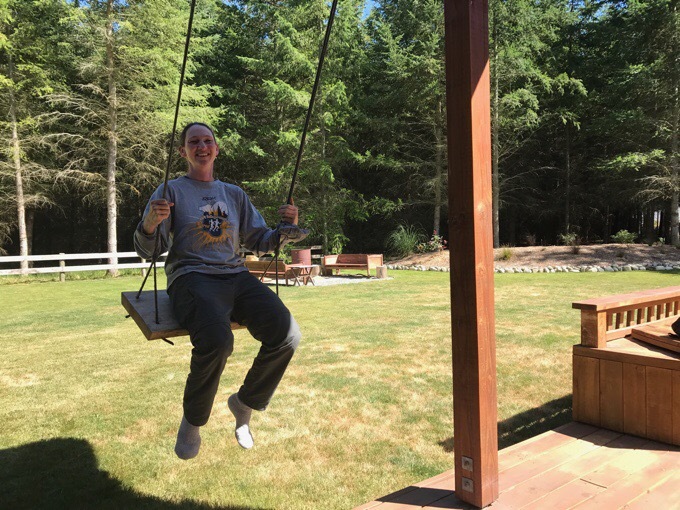 I finally have a chance to catch up on your adventures ….. love the fire pit and you on the swing . Sounds like the perfect place to have a day off . My kids used to have that “Felix ” book . I do totally understand Felix’s point of view .. anything over a month away from home and I start fretting about how things are back here in Linton ..
I’m really jealous of those amazing looking tomatoes. And that BEAUTIFUL house and property! !